A health worker in protective clothing carries a girl suspected of having Ebola in the MSF treatment centre on 05 October 2014 in Paynesville, Liberia. Ebola and Marburg haemorrhagic fevers are rare but deadly, spreading fear and panic. Caring for infected patients and affected communities is crucial for a response to be effective. Outbreaks can kill 25 to 90 per cent of those infected. No cure exists and treatment is currently mainly symptomatic. MSF has intervened in almost all reported outbreaks over the past years. The 2014-2015 Ebola epidemic in West Africa was unprecedented: 67 times the size of the largest previously recorded outbreak, it reached urban areas, and killed more than 11,300 people. Hundreds of health workers died, decimating the already-struggling healthcare systems of Liberia, Guinea and Sierra Leone. An Ebola team speaks to a family in Moa Bay Wharf, Freetown, Sierra Leone. Once a case of Marburg or Ebola is confirmed, a swift response is vital. The needs of patients and affected communities must remain at the heart of the response, which can be defined by six main pillars : care and isolation of patients; tracing and follow up of patient contacts; raising community awareness of the disease such as how to prevent it and where to seek care; conducting safe burials; proactively detecting new cases; and supporting existing health structures. A technician from the Public Health Agency of Canada tests a patient's blood sample for Ebola at an Ebola Treatment Centre in Kailahun, Sierra Leone. Diagnosing Ebola or Marburg is difficult because early symptoms, such as fever and sore throat, are common to many illnesses. A patient presenting early symptoms should be cared for and isolated to prevent further risk of infection to relatives and care takers. Public health professionals should be notified and a laboratory test must be carried out to confirm a diagnosis. Such tests are an extreme biohazard risk and should be conducted under maximum biological containment conditions. There is no specific treatment for Ebola or Marburg haemorrhagic fevers. Standard care is limited to supportive therapy, such as hydrating the patient, nutritional support, providing fever and pain medication, and drugs to reduce vomiting and diarrhoea. Other diseases the patient may have such as malaria or sepsis, should also be treated. Patients should be isolated to prevent infecting others. Psychological support should be provided to help patients and families. 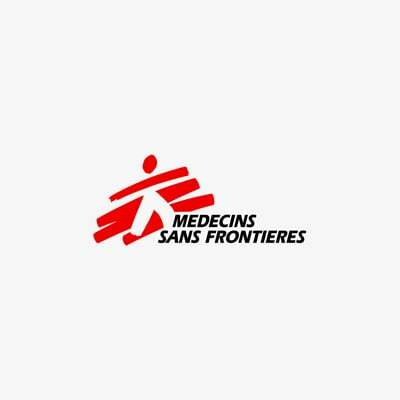 How does MSF care for patients suffering from Ebola? Medical workers put on PPE gear in the changing station at the Nongo Ebola Treatment Clinic in Conakry, Guinea, November 27, 2015. Human to human transmission occurs through contact with bodily fluids of an infected person or through surfaces contaminated with these fluids. Infection control in health centres is vital to reduce risks for other patients, for caregivers and health workers. Those caring for infected patients must wear personal protective equipment (PPE). Direct contact with the deceased can transmit the virus, so burial teams also use PPE, and safe burials must be carried out in a dignified manner for family members. A volunteer Ebola frontline worker receives an experimental vaccine at a vaccination clinic inside Donka Hospital compound, Conakry. In the wake of the 2014-2015 West Africa Ebola epidemic, an investigational vaccine was developed that can help control an outbreak. The vaccine is currently being trialled in an Ebola outbreak in the DRC, as part of the overall strategy to control the epidemic. MSF is vaccinated Ebola frontline workers and patient contacts in remote communities in Bikoro, Equateur Province. Participation is voluntary and the vaccine is free. 24 year old Ebola survivor Aminata undergoes an eye test with MSF health promoter Joseph during an MSF outreach mission the village of Mabekoh. Koroma survived the disease after being treated by MSF in Kailahun, but four members of her family died. Survivors often face stigma and are ostracised from their communities. This, and the trauma of having lived through such a deadly disease, often requires counselling. People may experience ongoing physical side-effects, such as joint pain, headaches and eye problems that require treatment and follow up. MSF established Ebola survivor centres in three worst-affected countries after the West Africa epidemic. Millions of people still die each year from infectious diseases that are preventable or can be treated. On 1 August 2018, Democratic Republic of Congo (DRC) declared an outbreak of Ebola in the country's northeast. With the number of confirmed cases passing 1,000, it is now by far the country's largest-ever Ebola outbreak. It is also the second-biggest Ebola epidemic ever recorded, behind the West Africa outbreak of 2014-2016. The West African Ebola outbreak of 2014–2015 took a severe toll on the Liberian health system, which was already fragile and suffering from inadequate medical infrastructures. While Guinea has a relatively low prevalence of HIV, at around 1.7 per cent, the country has one of the worst treatment coverage rates in the world, with only one in four people living with HIV receiving antiretrovirals (ARVs). Sierra Leone was finally declared Ebola-free on 17 March 2016 and the country is now struggling to rebuild its shattered health system.